You can listen to Faye’s reading here. Faye Boland won the Robert Leslie Boland Prize 2018 and the Hanna Greally International Literary Award 2017. She was shortlisted in 2013 for the Poetry on the Lake XIII International Poetry Competition. Her first poetry collection Peripheral was published in September 2018 by The Manuscript Publisher. She is a member of Clann na Farraige writers group in Kenmare, Co.Kerry. Terry McDonagh, poet and dramatist works in Europe, Asia and Australia. He’s taught creative writing at Hamburg University and was Drama Director at the International School. He’s currently working with Cuirt, Dublin West Education, Mayo County Council, International School Bonn and others. He’s published eleven poetry collections as well as letters, drama, prose and poetry for young people. McDonagh’s work has been translated into German and Indonesian. His latest collection Fourth Floor Flat – 44 Cantos, was published autumn 2018 by Arlen House. He lives in Hamburg and Mayo. Ó Bhéal’s 12th Anniversary event celebrates the launch of Five Words Volume XII and the winner of our 6th Five Words International Poetry competition, Mary Anne Smith. 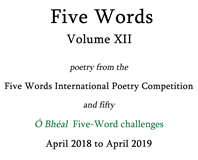 Other shortlisted poems will also be read on the night – as will poems by contributors to Ó Bhéal’s Monday night Five Word Challenges held over the past 12 months. The anniversary open-mic is only for poems written by other poets, so bring a favourite or two! Prize-winning writer Mary Anne Smith‘s work has been recognised in both national and international competitions. Most recently she won first prize in the November 2017 Sentinel Literary Quarterly competition for her poem Dreamland, and second prize in their August 2018 competition for Rural Living. Two of her poems, Unbroken and The Lych Bell, were shortlisted in the 2018 Hungry Hill Writers ‘Poets Meet Politics’ competition. Mary Anne’s work has been published by Confluence Medway, Camden Lumen Poetry, Spilling Cocoa over Martin Amis, and The Kentish Gazette, and broadcast on radio programmes and podcasts in both the UK and the USA. In May 2017 she co-developed and took part in a poetry and music event ‘The Colours of Love’ at the Wise Words Festival in Canterbury, and is one of the four poets on the bill for the 2019 WhitLit Festival, in Whitstable, Kent. The natural world, landscape, architecture, history and art are all influences on Mary Anne’s work. She is currently working on poems towards her first full collection. Mary Anne is a bookseller who lives and works in Canterbury. 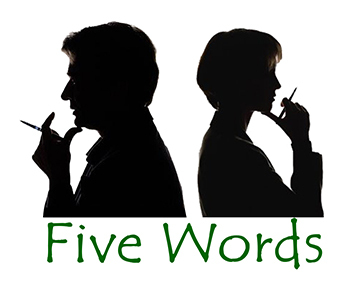 The 7th Five Words International Poetry Competition will begin on Tuesday the 16th of April 2019 (at midday GMT) and run for 41 weeks until the 28th of January 2020. Judges will be announced soon. For submission guidelines and previous winners, visit the competition page here. Majella Kelly is from Tuam, Co. Galway. In 2018 she won the Annual Ambit Poetry Prize, came second in the Gregory O’Donoghue International Poetry Prize, and was shortlisted for a Hennessy Literary Award. In 2017 she was nominated by Crannóg for a Pushcart Prize and selected for the Poetry Ireland Introductions Series. In 2016 she came third in the Resurgence Eco Poetry Prize (now the Ginkgo Prize). Her poetry has been widely published in such places as The Irish Times, Poetry Ireland Review, Southword, Ambit, Cyphers, The Pickled Body, The Well Review, Best New British & Irish Poets 2017, and Aesthetica’s Creative Writing Annual 2017 & 2018. She holds a Masters in Creative Writing from the University of Oxford. Tania Hershman‘s debut poetry collection, Terms & Conditions, appeared from Nine Arches Press in July 2017 and her third short story collection, Some Of Us Glow More Than Others, is published by Unthank Books. Tania is also the author of a poetry chapbook, Nothing Here Is Wild, Everything Is Open, and two short story collections, My Mother Was An Upright Piano, and The White Road and Other Stories, and co-author of Writing Short Stories: A Writers’ & Artists’ Companion (Bloomsbury, 2014). Tania is curator of short story hub ShortStops (www.shortstops.info), celebrating short story activity across the UK & Ireland, has a PhD in creative writing inspired by particle physics and is writer-in-residence in Manchester’s Southern Cemetery. Joe Neal was born half way up a mountain in North Wales and now lives near a waterfall in Edenvale, Co Wexford – so the vividness of nature features prominently in his work. In 2017 he won the Anthony Cronin International Poetry Award and has published six collections of poetry – Telling It at a Slant, Turn Now the Tide, Hear the Colour, Still Rise the Sun, The Next Blue Note and Rossetti’s Wombat. 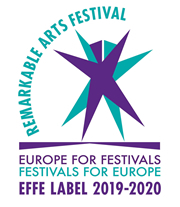 Neal recently returned from an Arts Council Bursary tour of New England and has featured in a number of festivals, including the AberJazz in Wales where he read from his work to the accompaniment of piano. His poetry has been praised for its “impeccable rhythm and lyrical energy.” He says that as a poet one of his greatest privileges was to read alongside Thomas McCarthy at the annual Write By the Sea Festival in Kilmore, Co Wexford – as well as reading some of Seamus Heaney’s poems on BBC TV on the night it was announced that Heaney had been awarded the Nobel Peace Prize for Literature. Originally from Connemara, Áine Durkin has been living in Inishowen since 1980. She has won literary prizes at Oireachtas na Samhna for her blog Mise Áine (2010), and for her collection of songs and poetry Mise Áine, An Bhean Istigh (2017). Her songs, Le do Thaobh and Grá Faoi Bhláth have won prizes at the national Pan Celtic Festival in 2013 and in 2018. Her new song, Ní Thuigim, will compete in this year’s National Finals of the Pan Celtic Festival in Carlow and her song, Féile na Nollag won the Ros Na Rún/Raidió na Gaeltacht Christmas Song Competition in 2013. Áine is the author of the blog Mise Áine ag Rámhaille. She has contributed Irish language articles and poetry to various media outlets and magazines over the years. She was awarded a first-class honours degree in Irish Language and Literature from the University of Ulster (2007). As Conamara ó dhúchas, tá Áine Durkin ina cónaí in Inis Eoghain ó bhí 1980 ann. Bhain sí duaiseanna liteartha ag Oireachtas na Samhna dá blag Mise Áine (2010), agus dá cnuasach filíochta/amhrán Mise Áine, An Bhean Istigh (2017). Bhain a hamhráin, Le Do Thaobh agus Grá Faoi Bhláth duaiseanna (Féile Pan Cheilteach, 2013 agus 2018); mar a bhain Féile Na Nollag (Ros Na Rún/Raidió na Gaeltachta, 2013). Ise údar an bhlag Mise Áine ag Rámhaille. Beidh a hamhrán nuachumtha Ní Thuigim san iomaíocht ag an bhFéile Náisiúnta Pan Cheilteach, i mbliana. Cuireann sí dánta, agus scríbhinní eile, ar fáil d’irisí agus do na meáin, go rialta. Bhain sí céim chéad onóracha amach i dTeanga agus i Litríocht na Gaeilge ó Ollscoil Uladh (2007). Derek Sellen lives in Canterbury and his work has been widely published in magazines, Arts Council, Cinnamon Press and PEN anthologies and online. He won the Ó Bhéal Five Words competition in 2015 and has also won Poets Meet Politics, Poetry Pulse, Canterbury Festival Poet of the Year and Rhyme International among other competitions. He has read his work in the UK, Ireland, Italy, Germany and Russia. His collection The Other Guernica (Cultured Llama, 2018) contains poems inspired by Spanish art which also treat contemporary concerns from modern warfare to social inequality. Philip Metres has written ten books, including Sand Opera (2015) and The Sound of Listening: Poetry as Refuge and Resistance (2018). He has also published numerous translations of the poetry of Sergey Gandlevsky and Lev Rubinstein. Awarded the Lannan Fellowship and two Arab American Book Awards, he is professor of English and director of the Peace, Justice, and Human Rights program at John Carroll University, Ohio. Dave Lucas is the author of Weather (University of Georgia Press, 2011), a book of poems for which he was awarded the 2012 Ohioana Book Award for Poetry. His poetry has appeared in such journals as The American Poetry Review, Blackbird, The Paris Review, Poetry, Slate, The Threepenny Review and Virginia Quarterly Review. In 2018, he was appointed the second Poet Laureate of the State of Ohio. He lives in Cleveland, Ohio, and teaches at Case Western Reserve University.